I have to paint and I have to paint horses, it’s why I’m here. I invite you to join my artist’s journey where inspiration is nurtured from concept to completion. 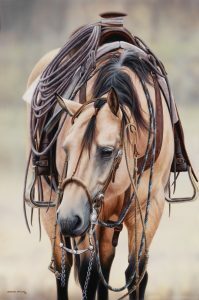 View Shannon Lawlor Western where I share my personal inspiration for creating equine art. From my easel, here are three key elements that drive my attention to equine subjects and may help expand your experience with equine art. You don’t have to be an artist to know when a special horse comes along and makes a direct path into your heart. What would our world be without them? The love and lessons they bring us can be all consuming and make deep impressions on us. You might have been lucky enough to own that horse, or maybe it was a horse that caught your imagination or admiration. During my time as a horsewoman and an artist, I’ve had the luxury of being blessed with many great horses and ponies alike. So when a great horse crosses my path and stops me in my tracks, I listen, observe, remember, compare, photograph. And if the stars all line up, a painting then evolves from this experience. And while this connection is true of all my inspiration for equine subjects, I would like to elaborate on my latest work Chello. What was the inspiration of this particular buckskin that captured my attention? Having seen Chello at the Historical Bar U Ranch Rodeo, I kept gravitating back to him that day in the sunburnt foothills of the Rockies. With the softest feel he and his owner, Drew, unassumingly went about their day. I was drawn to this pair as I have a weakness for a good buckskin horse, along with deep appreciation for vaquero inspired gear and most importantly, good horsemanship. Collectively, they had my full attention. Hours of photographing, editing, contemplation and months later, countless hours at the easel in the dead of winter, Chello evolved. For me, as a horsewoman and artist, Chello represents everything I love about special horses. He and Drew are everything I believe the West to be, and together, they are all encompassing of what the special bond and relationship is between a person and a great horse. Want to continue your journey into equine art with Shannon? Sign up here so you don’t miss any insider info, special deals or release of new art. Fabulous essence captured in a way that allows your appreciation for the subject to shine. Simply beautiful. Glad you enjoyed it Stefanie, thanks so much!